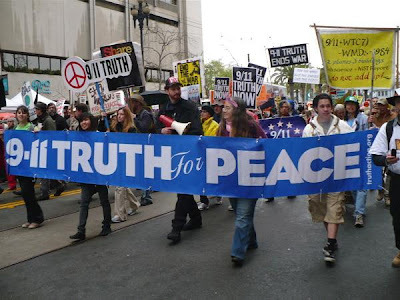 NOTE: There is information about Sydney's anniversary "9/11 Truth for Peace" Protest at the bottom of this piece! So why should we believe that “9/11 Truth” can stop the war in Afghanistan and bring the “War on Terrorism” to an end? I will lay out below the non-conspiratorial reasons why it is vitally important that we continue to demand accountability from our governments, on why it is they went to war on our behalf in 2001. I will also argue why I am correct to strongly assert that the pursuit of 9/11 truth and a criminal investigation of those events is the only practical path to peace today. On the 11th of September 2001 the world entered a very dark chapter of its history! We were promised a 100 years of war in this "New American Century" fighting "the terrorists" wherever the American Empire deemed they were, and at the time of their choosing. We were told that this "New Pear Harbor" event carried out on 9/11 by the CIA born Al-Qaeda was a fair and reasonable reason to carry out a preemptive strike against their supporters the Taliban, by the invasion and occupation of Afghanistan. The vast majority of the world’s population and its governments rallied behind the US determined to fight Islamic terrorism together world wide. Although some more skeptical commentators and governments were cautious with their support for this so called “War on Terrorism”, they found themselves intimidated into silence. For the Bush/Cheney Administration and its powerful media supporters made it abundantly clear “that you are with us or you are with the terrorists” GWB. The newly elected (?) Bush Administration and its Neo-Con agenda (Rebuilding America’s Defenses) went into full swing in the last few months of 2001 by the use of this powerful new catalyst of fear, 9/11. The American public was so angry and shocked by 9/11 that they were literally cheering for revenge and in full support of military retaliation. Innocently and traumatized they trusted the story they were told about 9/11 without evidence, and also trusted that George W. Bush would lead them to victory against the terrorists and capture Osama Bin Laden “dead or alive”! Still for the Bush Administration to be able to see their new “pre-emptive war doctrine” slide into position with an Afghan War, rather than being seen as a “war crime”, the US Government had to give many assurances to the world and it’s governments. Assurances that evidence would be produced to prove their Bin Laden Al-Qaeda “conspiracy theory” in a White Paper and that they would investigate how it was that the attacks happened. Making that investigation the basis of their policy to stop such terrorism into the future. They would with out a doubt address their massive military and intelligence failures on 9/11 and make changes to prevent any further now expected attacks. They also made many hollow promises to the American people. Like they would look after the welfare of the 9/11 First Responders, who are still waiting for basic health care as they fall in the thousands to the effects of the toxic dust they were told was safe! They also said they would get to the bottom of the massive and unprecedented structural failures of the three WTC towers 1, 2 and 7. Those towers that fell that day at near or actual free fall speeds led to the death of 343 New York Firefighters and thousands of civilians who never imagined the buildings would collapse at all. Today a growing number of Firefighters, Engineers, Architects, Scientists and building professionals question these collapses as inconsistent with being caused by fire and aircraft damage alone. The collapse of building 7 (not hit by a plane) and the discovery of Nano-Thermite in the collapse dust being the clearest evidence that pre-planted explosives and incendiaries charges within the buildings assisted in their destruction. Who did this and why and how it happened is clearly needed to be investigated in a criminal court immediately. Unfortunately it is true and un-controversial to state unequivocally that we, the public have received none of what the US Government assured us they would deliver. Rather we have seen in an unprecedented manner the most obvious and ruthless cover up and destruction of evidence and testimony around the events of 9/11. This lack of accountability is most starkly supported by the statement by the chairs of the 9/11 Commission Report, that “they were set up to fail” and that NIST the National Institute of Science and Technology is unable to explain many aspects of the building collapses. Some of the things they can not and will not explain include; the actual collapse sequence of the Twin Towers, the molten iron found at ground zero and the simply unbelievable “absolute” free fall of building 7 for over 100ft of its fall! To this day, we the people of the world have no idea based on official “testable” reports of what really happened on 9/11! Who is responsible for those heinous crimes is a question that simply can not be answered without a criminal investigation. Secrecy is everywhere and truth, transparency and justice are nowhere to be seen? The 9/11 Truth Movement world wide have been demanding a new investigation of the events of September 11, 2001 for 9 years now and have continuously pointed out that we should withdraw the troops from Afghanistan immediately until we know who is responsible for the 9/11 Attacks. The FBI still have not indicted Bin Laden for 9/11 as the say they have “no hard evidence” connecting him to those events? Disturbingly Khalid Sheikh Mohammed the so called “mastermind” of the 9/11 attacks, whose tortured testimony is the basis of the official 9/11 “conspiracy theory” in the “9/11 Commission Report” remains un-charged to this day for those crimes? Although much work has been done by citizen researchers to discover who may or may not have been involved with carrying out the 9/11 Attacks, such endeavors are impossible to fulfill without subpoena power in a courtroom. Recently two more Australians died in Afghanistan fighting a provably illegal war on behalf of the Australian Government's support for the “War on Terrorism”. This Government support of the war is based on the the understanding that the 9/11 Attacks were a direct result of the Taliban supporting and harboring the terrorists responsible for the crimes committed on 9/11. Remove this justification and their is absolutely no reason for any further support! This 9/11 war in Afghanistan has now taken 20 of Australia’s finest in the field, which is double the number of Australians that where killed on 9/11. How many innocent Afghans have died because of the invasion and occupation is anyone guess as the media and the military have little interest in finding out the true figures to date. Estimates put it at approximately 30,000 people, although it's probably a much greater number? The Australian 9/11 Truth Movement are determined to expose to the Australian people the facts that dispute the legitimacy of the official story of 9/11! They continue to demand that Australian troops are immediately removed from Afghanistan until 9/11 is properly investigated and evidence is produced to demonstrate Afghanistan is responsible in any way for those attacks! It is clear from the simple facts that are on the public record that nine years on there is no mandate or excuse for the invasion and occupation of Afghanistan, and that 9/11 truth is the only practical path to peace today. With out exposing that the pretext to this war is simply not based in reality, the anger and hatred of the people in the west ignorant of the facts will allow the bloodshed to continue. The term "9/11 Attacks" refers to the UNPROVEN ALLEGATION that Muslims violated the sovereignty of the U.S. on 9/11/01 in an unprovoked Act of War? Since, as you state in your article, there is NO EVIDENCE to back up this allegation, why continue to use the malicious label? Each time any of us the term "9/11 Attacks," we are maliciously labeling Muslims as being guilty for 9/11. Let's all agree to stop using this unfair term and use neutral terms such as "9/11 crimes" or "alleged 9/11 attacks." Awesome article! And, hats off to you guys working so hard down there in Australia!!! LV911Truth on Thu, 08/26/2010 - 8:21am. ...the essay makes no sense to me at all. an attack can be from anywhere and anyone? John Bursill on Thu, 08/26/2010 - 4:33pm. Danse on Thu, 08/26/2010 - 11:26am. Thanks and thank you for that fine film you just released! An interview with you sometime would be great? PS - Encouragement is hard to find in our world so it is most definately appreciated and it will translate into activity. I don't know why many have problems with that concept:) Maybe they have an agenda? John Bursill on Thu, 08/26/2010 - 4:36pm.